24 | February | 2016 | Papers, Please! February 24, 2016 – Papers, Please! How many states have actually complied with the REAL-ID Act of 2005? Only four out of fifty-six states and US territories, we’ve recently learned. The US Department of Homeland Security is trying hard to convince reluctant state governments that resistance to the REAL-ID Act is futile, because most of the other states and US territories have already complied or agreed to do so. Are any of these DHS claims true? No. The REAL-ID Act requires any state or territory that wants to issue driver’s licenses or state ID cards acceptable for “Federal purposes” to, “Provide electronic access to all other States to information contained in the motor vehicle database of the State.” A state that does not give other states full access to its database of drivers and ID cardholders is not “compliant” with the Federal law. As we’ve previously reported, the only system currently available (or likely to be made available, given the cost and complexity of developing an alternative) for states to make their driver’s license and ID databases accessible to other states is the S2S system operated by the AAMVA. This included the SPEXS “pointer” database — the centrally-located national ID database the DHS keeps claiming doesn’t exist — with information about all REAL-ID compliant licenses, ID cards, drivers, and cardholders. How many states actually participate in S2S and SPEXS? Unable to find any published information about this, we asked Chrissy Nizer (Maryland’s Motor Vehicle Administrator) and Nancy Carlson (Senior Business Analyst for Clerus Solutions, the prime contractor to AAMVA for the development of the S2S and SPEXS system), who were until recently identified publicly as points of contact for S2S and SPEXS. In response to our last blog post about REAL-ID, which included diagrams and the list of the fields in the national REAL-ID database from the SPEXS specifications, AAMVA moved the SPEXS specifications and the entire “State-to-State” section of its website behind a login firewall. AAMVA also blocked the S2S software download directory of their website from Web crawlers. 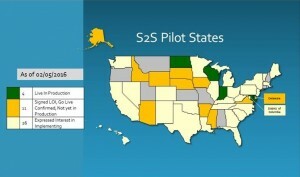 In August 2015, Wisconsin was the first state to participate in S2S. North Dakota joined in November 2015. Maryland joined in early February 2016 and Indiana joined in February 2016. We have a total of 15 states that have signed Letters of Intent to participate in S2S. All 15 pilot states plan to implement the service by December of 2016. The map [above] shows the current status of the states with respect to S2S. The S2S pointer index is operated by the American Association of Motor Vehicle Administrators (AAMVA) at a datacenter located in Virginia. AAMVA is providing these services under contract to the Mississippi Department of Public Safety (MSDPS). States and territories that aren’t compliant with the REAL-ID Act are in good company, and should stand firm. Fifty-two of the total of 56 states, US territories, and the District of Columbia are not yet making their state databases available to other states, as will eventually be required if they choose to comply.